Woolworth and Municipal Bldgs. from Brooklyn Bridge, New York. 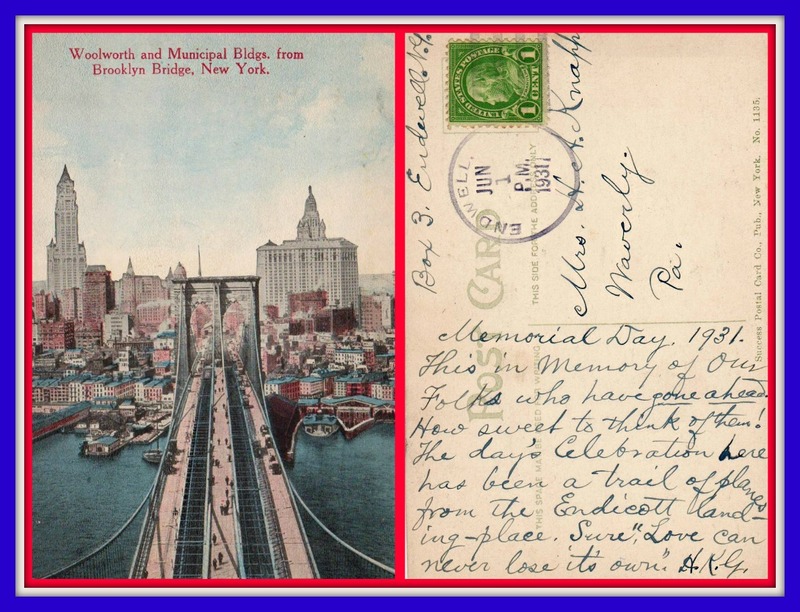 Her husband Henry A. Knapp (b.1851, d. 1931 the year this card was written) started as a filing clerk in Pennsylvania and rose to become a prominent lawyer who, in 1899, established the borough of Vandling in Lackawanna County, Pennsylvania. As of the 2010 census, Vandling has a population of 751. The ‘Endicott landing-place’ refers to a landing strip that was to become the Tri-Cities Endicott Airport, established in 1936. The poetic quote: “Love can never lose it’s own” is from a poem entitled “Snowbound/Firelight” by influential American Quaker poet John Greenleaf Whittier. That somehow, somewhere, meet we must. The stars shine through his cypress-trees! Across the mournful marbles play! Atop the Clock Tower Gallery with the Woolworth Building in the background. 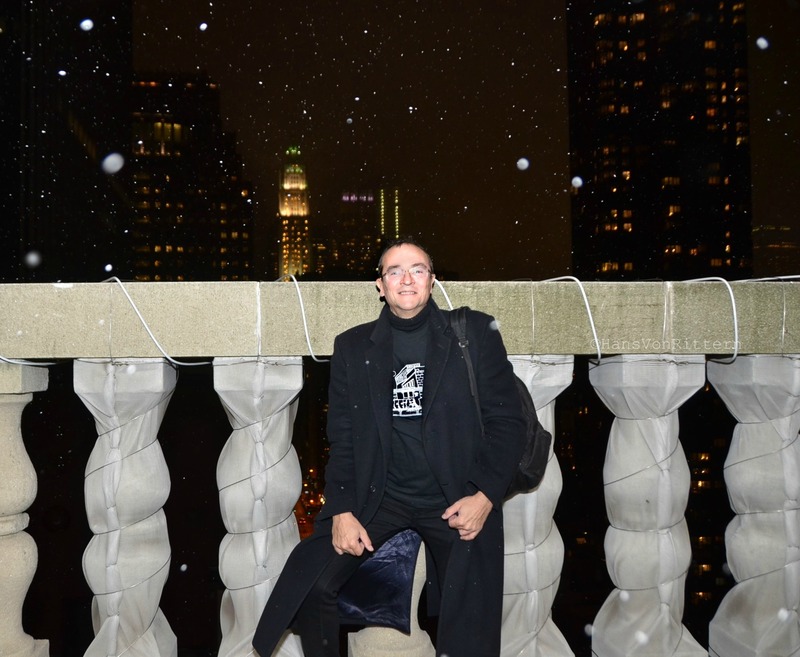 Photo of the day: FIRST SNOWFALL OF THE WINTER ATOP THE CLOCK TOWER GALLERY – It’s official, as of 8:30pm Saturday night, November 23rd 2013 – winter has arrived. I was atop the Clock Tower Gallery for it’s closing farewell party as a bitter cold wind brought the first snowfall. Brrrrrrrr! 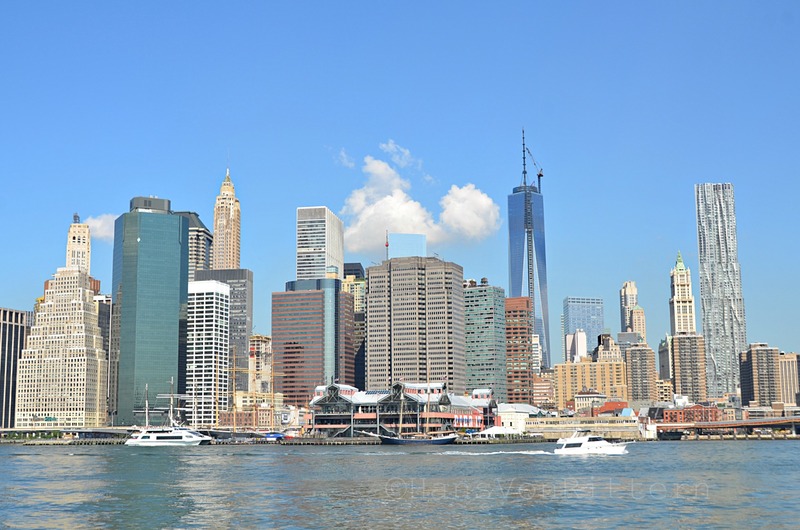 Photo of the day: THE DESTRUCTION OF SOUTH STREET SEAPORT – The ever changing skyline of Manhattan is about to change again, the beloved South Street Seaport also known as Pier 17, thanks to the ever greedy Mayor Michael Bloomberg, is about to be torn down at the end of September. FINAL DAY OPEN IS THIS MONDAY SEPT. 9th. What will replace it? A big soulless glass box (mall) with a red letter sign atop of it “South Street Seaport”. You wouldn’t need big lit red letters screaming “Seaport” to remind people of where you are if you have removed any vestige of our once great seaport’s history. One of our old sailing ships the Peking will soon cease to exist for lack of funds to repair it, that will leave us with on single solitary ship in what once was the greatest and busiest harbor in the world. Our Mayor Bloomberg and his cohort councilwoman Christine Quinn should be tarred and feathered and drummed out of New York for destroying our seaport’s heritage. Anyone But Quinn for mayor! 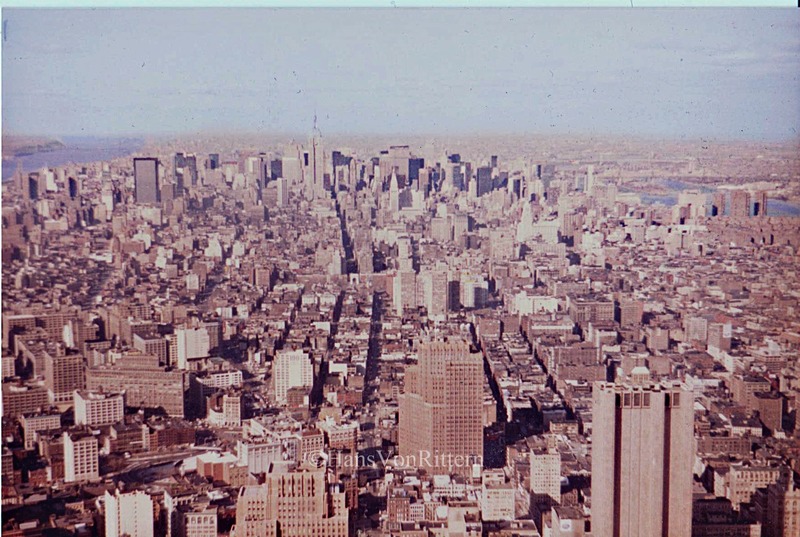 Mondays on Memory Lane: MY OFFICE VIEWS FROM THE 102nd FLOOR OF WORLD TRADE CENTER SOUTH TOWER – With the advent of the spire topping off and finishing the new World Trade Center Tower, I will tell you what it was like to work in the original towers. In 1983 I got a job on the 102nd floor of the World Trade Center, the south tower. I was senior project manager of a commercial design firm named Dancker, Sellew & Douglas. I worked there with my dear friend Helene Bernicoff. My desk was right near the tall floor to celing windows. It was incredible. On my first day to work – I was late! I am German, Germans are never late! But I was. You see, I had calculated the exact amount of time it took to take the subway from Rego Park, Queens to the Trade Center. What I had not calculated on was the vertical traveling time. That took an additional 12-15 minutes. 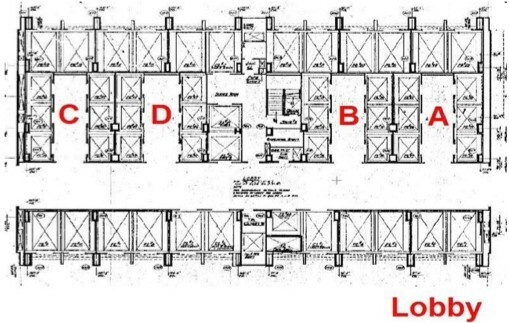 By the time you found an express elevator in the rush hour that had room to take you to floors 50 and 100, then, transferred to the local elevator which took you to floors 101 – 110. . . it was 12 to 15 minutes vertical traveling time! To transfer from a “local” to an “express” was something one usually does with trains and buses, not elevators, it was surreal. Then you had to un-pop your ears every morning as you arrived at your desk. (There were 198 elevators in total). My view was north. I could see the whole of Manhattan, the Chrysler Building, The Empire State Building, Central Park and far into New Jersey. My friends relied on me for weather forecasts. If the radio said it was a sunny afternoon for the park, I would contradict the radio and say, ‘No, no, I see a big dark weather pattern coming in the from the north or the south’. It was fun. 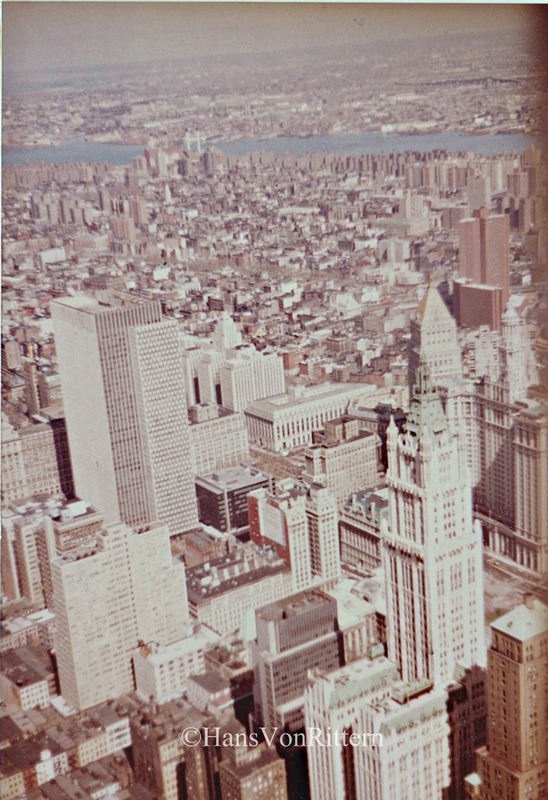 Northeast view from the original World Trade Center Tower. Woolworth Tower below. On stormy days the building would sway in the wind, it had to of course. The girls would complain and say they were getting sea sick…no they weren’t, they just wanted to go home to watch their soap operas. There were 12 lobby elevators which expressly took you to the higher floors, twelve of them. Each was the size of a cattle car – huge! On very stormy days, only the outer corner elevators would be operational because we were told the center 10 car cables were not stable enough to handle the swaying…great to know. Once inside the elevator, even the biggest loudmouth shut up. There was always this “silence” in the elevators. On those stormy days you had to learn to balance yourself. No, not walking – in the toilet. You see, the water in the bathroom bowl swayed the way it does on a ship in stormy high seas. If you weren’t careful, you’d get a wet bottom. Since we were a design firm, we had many colored markers at our desks. What we would do, is to attach one of the markers from the ceiling with a string and hang it so the tip would touch a piece of paper on our desk. We would watch the marker make the same pattern on the paper over and over again as the building swayed. As the wind shifted, so did the design on the paper. I wish I had kept on of those papers, but it was a novelty taken for granted in those days. There was always ‘white noise’ in the background, the hum/buzz of the air ventilation systems, it was like being on an eight hour airplane ride daily. To work in the clouds – a memory I will never forget and always treasure.